The first ever automatic conversion of photoshop® .psd files to html. 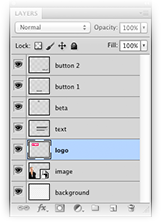 Retain original layers including positions as html div layers. Convert your .psd file to html online in three easy steps: Upload your .psd file, check HTML and PNGs, download files as .zip package. This service can not be used to create out-of-the-box themes for any CMS (content management Systems) like Wordpress, Joomla, Drupal or shop systems like Magento, Shopware, Plentymarkets, OXID, xtCommerce or others ! 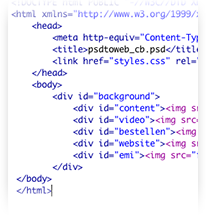 These systems rely on HTML-text based content and grow their dimensions with changing content. PSDTOWEB creates non-sizable images of each element and can't be used as a theme. Like this service? Please donate to keep it free! Please help us keeping it free by considering a donation. Need more than just basic html? Try us! As mentioned before we are a web agency and are handling web projects of virtually any size for our clients. Basic pages as well as large platforms are part of our portfolio which you can find on www.progressivedesign.de. We offer sites based on basic html and a large number of different CMS options - including Wordpress and Drupal - and technologies (PHP/SQL,AJAX/jQuery,HTML5,Web-Apps). Don't hesitate to contact us. Adobe® and Photoshop® are either registered trademarks or trademarks of Adobe Systems Incorporated in the United States and/or other countries. This service isn't in any way affiliated with Adobe or Photoshop.